Starring: Sean Bean and a bunch of actors you probably never heard of. A Medieval fantasy TV show called 'Game of Thrones'. No thanks, I thought. Besides the awesome looking throne in the poster above, I thought there'd be nothing really appealing for me. As the show went on I had more and more friends rave about it so I thought I might give it a shot. I'm really glad I did because this is actually a really good show. 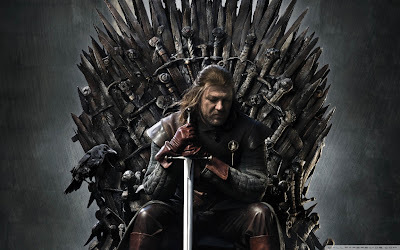 Based on A Song of Fire and Ice, the series of George R. R. Martin novels, Game of Thrones is probably the realest (if you will) fantasy show since maybe Lord of the Rings. What I mean by that is, since Lord of the Rings all other fantasy shows/movies have looked second rate to me. Clash of the Titans absolutely killed me. Hated the look of that movie. Game of Thrones? This show is legit. The costumes, the castles, the killings... perfect. Stunning visuals aside, there is actually a very solid plot line to this show, not just the good old, good guys bad guys rivalry. It's actually pretty full on. There's the King of the seven Kingdoms, the devious family of the Queen, his best friend (Bean) the Lord of North Landing, The brotherhood of the Night's Watch who protect the Wall from crazy un-dead beasts, then there's the exiled Prince Viserys Targaryen, son of the previous King who is trying to recruit an army to win the throne back.... ugh, there's just so much happening in the 10 episode season and is absolutely enthralling. This show has also received Emmy praise with multiple nominations and also a win to Peter Dinklage for Best supporting actor in a drama series. Don't be scared away by the lack of star power in this show. Sean Bean is excellent and so are the rest of his lesser known counterparts. The acting, along with the fascinating story line, brilliant costume design and straight up pimp iron throne for the king make this a very worthy show. Check it out. After watching this show, I watched Lord of the Rings and ... now I just can't take it seriously. LOTR seriously looks and feels like a kids movie. The costumes, themes, characters. Game of Thrones is so much more complex and 'real'. The characters have layers and agendas. There is no simple 'good vs evil' fight here. More multiple shades of grey. Most fascinating show I have seen in a loooong time.